Hunting boots are no ordinary hiking boots. It is highly recommended that you invest in good hunting boots for your comfort on the hunting field. 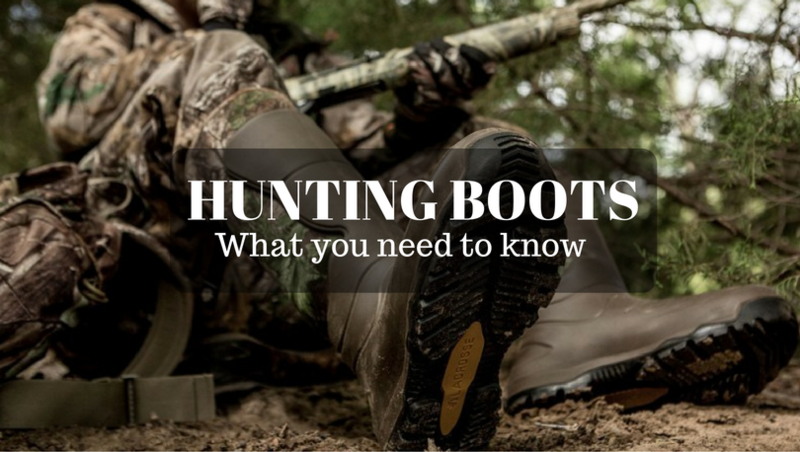 Here’s a guide on all the things you need to know about hunting boots. From buying to fitting guide, special terminologies on design, how to waterproof and descent your boots, and a lot more, you’ll find it here. There are five main factors that you should focus on when choosing your hunting boots – insulation, fit, ventilation, durability, and terrain. We’ll discuss these factors as a hunting boot buying guide. Before we proceed to the buying guide, let’s tackle first this question – Is there a difference between hunting boots for men and women? Yes, mainly in the mold and heel arch. Most women have smaller feet, and higher arch than men, and there are several footwear manufacturers that design boots specifically for women. It’s just a matter of searching online the right type or asking the salesperson on which section you should consider if you’re looking for hunting boots for women. With these in mind, here’s a short guide on how to choose the best hunting boots for men and women. Factor 1: Where are you going to hunt? This will narrow down your search on what type of hunting boots you need. Where do you intend to use your boots? There are different types of boots designed based on your level of activity and terrain that you’re going to use it in. Upland Hunting Boots – Ideal for flat and easy terrain where you expect to do much walking. Mountain Hunting Boots – Designed with hard traction soles that will help support each step during your climb. Multipurpose Hunting Boots – As the name denotes, all-around boots. Rubber Hunting Boots – When the terrain is mostly made up of muddy paths, creeks, marshlands, these are your best friends that will get you going. Snake Boots – These have extended collars that usually go right up to your knees. It’s designed with special material that will protect your lower leg from snake bites. Factor 2: How cold will it be? Insulation will determine your level of comfort depending on the type of weather you’re in. If you shop around, you’ll find that most brands advertise the insulation details in grams. 200 grams or less – These are uninsulated boots that are designed for pleasant or warm weather and high amount of movement. 900 grams and up – These hunting boots are designed for cold to freezing weather. Because during these times most hunters are sedentary in their posts, these are geared to keeping your feet warm and stable against freezing and wet surfaces. 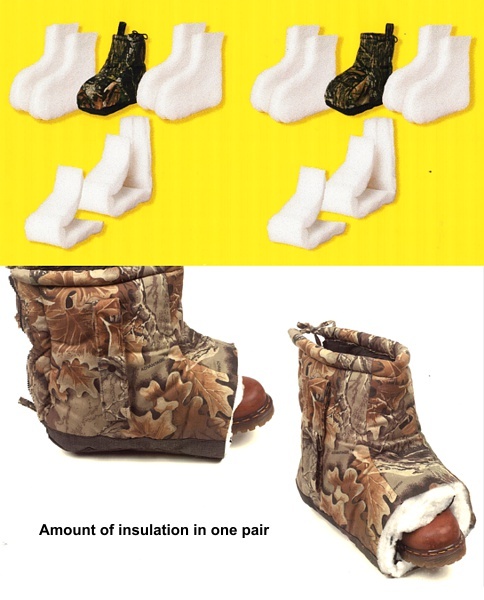 Thinsulate – This is the trademark of synthetic fiber insulation by 3M Corporation, which is commonly used by top winter footwear brands like Timberland, Irish Setter, Sorel, etc. PrimaLoft – Synthetic down insulation that was originally used in the army and LL Bean. Aerogel – Some winter footwear manufacturers like Timberland, Salomon Tundra and Irish Setter use this for extreme cold weather insulation. Next factor to weigh in, waterproofing. Factor 3: Can your boots swim? Obtaining waterproof hunting boots are very important. The boots ability to shed off water and moisture from your feet will determine how much longer you can remain on a cold field. Although you might project that you won’t be crossing creeks or any body of water with your boots, it always pays to be prepared ahead of time. Apart from keeping moisture off your feet, waterproofing will also play a role in protecting fabric or leather from rotting fast, thus adding some durability in your hunting boots. GORE-Tex – Look for a Full GORE-Tex bootie and you won’t be wasting your money. GORE-Tex is another trademarked synthetic fabric that is both waterproof yet still breathable. What does that mean? In simple words, it will keep your feet dry. Boot Rand – Choose hunting boots with rubber rand that runs all around the boot from the boot cap to the back. This will add protection from getting wet on puddles and shallow streams; it will also protect the insole from moisture and damage. Factor 4: Does it fit well? Apart from having the right boot size that matches your feet, here are some tips on finding the right fit. Have ample toe room – Ideally you want boots that are snug around your ankle, and heel, but allow some toe room. This will prevent your toes from bumping into the toe cap when your go downhill. Try it and walk on it – Don’t rush into buying without fully trying on and breaking in new boots. Lace it up carefully but do not over tighten. If the heel is loose, tighten the laces a bit near the bend of the ankle or just opposite the Achilles bend. If you have wide feet, it’s best to loosen the laces on your forefoot. This will prevent you from experiencing pain at the ball of your forefoot. If you have narrow feet and feel that the front part of the boots are too wide, you can tighten the laces there. But if that doesn’t work, you can purchase thicker insole to get a tighter snug. Too tight on your skin when your walk? The key here is the break-in your new boots. Loosen the laces in that area and walk around the neighborhood in your boots. Allow that part to flex as much as possible. Choose high boots – It’s not ideal to get short boots. With short boots, you won’t have enough insulation from your ankles up. Plus, when you’re hiking downhill, your toes will press towards the front of the boot, which can be painful and can cause blisters. Choose boots with Achilles flex – For added comfort when walking down on steep slopes. Choose boots with high and soft collar – The upper back of the collar should have soft padding, especially if these are high cut boots. You don’t want to get blisters from that edge. Hard sole with sharp lugs for mountain hunting boots – Normally you should choose flexible soles for everyday shoes, but for mountain hunting boots, it’s best to have those that do not flex. The reason is that it acts as your support platform when you climb up on rocky slopes. The sharp lugs underneath the sole will also add extra grip on edges and other surfaces. Dogs may seem to have bursts of energy with hunting, but if you notice that he starts to act tired or slow, it might be because he has sore feet! Hunting boots will protect your dog’s feet from rocks, sharp surfaces, and prickly burrs. It will also protect his feet from cold weather, especially during winter hunt. Boots should provide traction – Look for dog boots with patented design and material with a strong grip on ice, snow and slippery surfaces. Dog boots should keep the water out – Just like anyone; dogs also feel uncomfortable running in cold and wet feet. 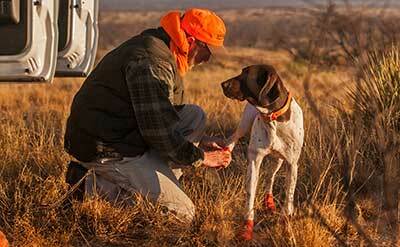 Look for dog hunting boots with insulation and waterproof design to keep the water out. Make sure it fits well – Have your dog try it out and make sure the size you got doesn’t slip off while he’s running. Some hunting boots for dogs have Velcro, but this doesn’t work well on wet situations or Look for boots with small buckles or another loop system. Scent Control – it’s very important to complete this step before you go out in the field. Animals have a very powerful sense of smell and at the very hint of human presence or anything unfamiliar, they scuttle away. 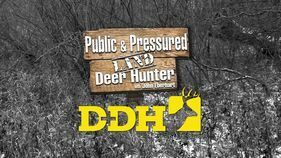 If you’ve noticed that some deer run away a couple of feet from your tracks, then you need to descent your trail. Don’t underestimate to cheap household ingredient that you can easily find in any supermarket. Here’s how you can use it to descent your hunting boots. 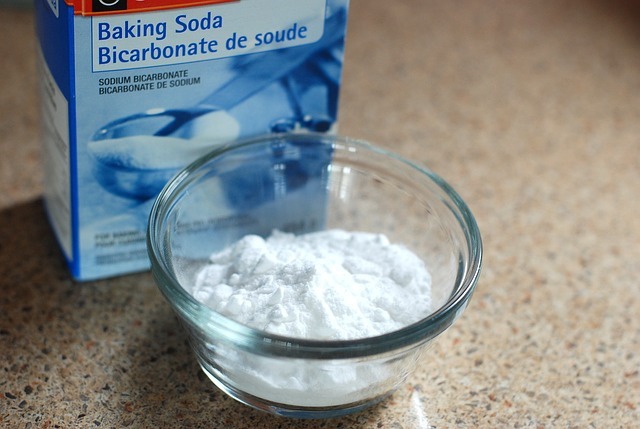 Create baking soda pouch sachet – Put some baking soda on a piece of cloth and then tie it with a string or ribbon. Keep this handy and put it on your hunting boots on every break that you’re not wearing them. Overnight sock of baking soda – Put some baking soda inside your socks and then put the sock overnight inside your hunting boots. Sprinkle baking soda all over – Sprinkle some baking soda on top of your hunting boots and let it absorb the odor overnight. By morning, just tap off the baking soda. Again, just be careful in using this on leather hunting boots. The buildup can cause the material to become brittle. 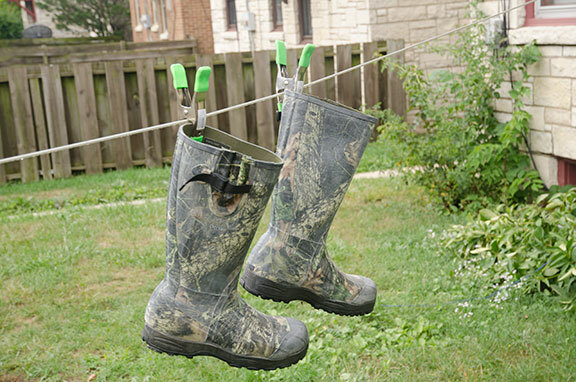 Fast track dryer – After each hunt, eliminate perspiration and odor by placing your hunting boots in the shoe Sprinkle some baking soda all over it and then just dust it off after the session. Some hunters use cover scent spray to neutralize their human scent. Here are some types that are worth using. Vanilla/Acorn/Pine Scent Cover Spray – It’s a good cover scent that piques curiosity from deer and other animals. Spray over your shoes before you step into your hunting area. Scent Free Wipes – Same as a cover spray, wipe around your boots and hunting gear. Many hunters now prefer rubber hunting boots than leather. The reason for that is it doesn’t hold scent like leather, and the material is airtight. Of course, make sure that your rubber boots are clean and scent free before you go out. Wash it with scent-free hunting soap. Let it dry outdoors with some sun or in a dry place. Don’t leave it under the hot sun too much as it might break down the rubber material. Spray it with scent free spray. Many of the hunting boots sold today have GORE-Tex that keeps the water out. However, over time, this waterproof membrane will break down. If your boots are still in good shape and still no tears or holes, you don’t need to buy new hunting boots. 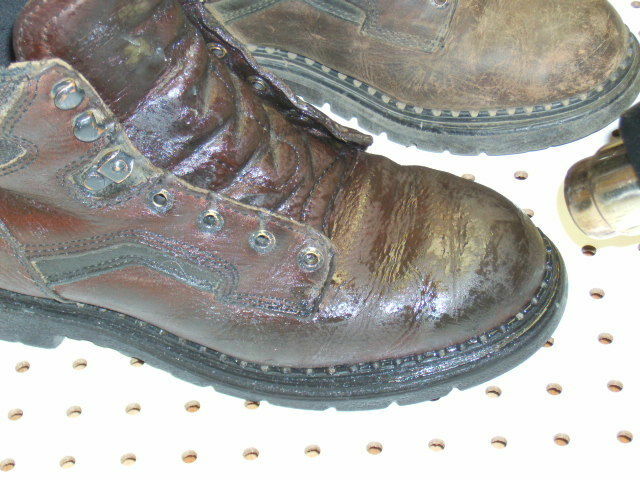 Use waterproofing oil, spray or cream to protect your boots from water and moisture damage. Apply the wax beside a warm place; this can be near the fireplace, stove or heating vent. Do not apply wax on rubber rand or surfaces. Also, be careful not get your boots too hot or near the fire. The warm temperature will help in absorbing the wax. Once the boots are generously coated with wax, let them sit for an hour or two near the warm area. This will last for a couple of weeks of usage, and when the boots look dull again, you can just reapply again. There are several types available in the market – cream, liquid form or some in a brush-on container for easy application. Along with it, you’ll need a hair dryer or work near a heating vent. Make sure your boots are clean and dry. Slather leather conditioner all over. Warm the coat with the hair dryer. Don’t put it near the leather too much as it might dry out and crack the material. The heart should break down the waxy component, and as the weather cools down, it will absorb more of the substance. These are mostly silicone sprays, and the compound is an excellent water repellant. You can spray this on almost any kind of material, and it works well. There are also oil-based sprays that work for leather boots. We hope that this guide was able to help you with your hunting boots questions. Remember to take care of your hunting boots so that it’ll last several seasons and years. 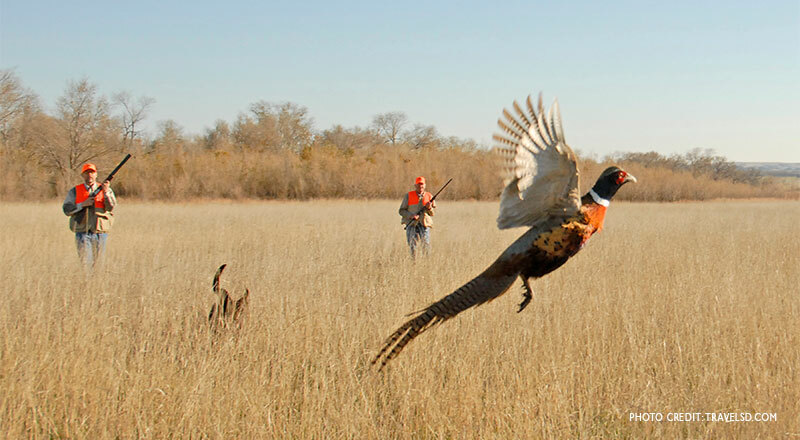 Make sure to keep it all clean after hunting, and store it in a cool, dry place.